Rebekah oBexo Borucki has heard this a lot. A certified yoga and meditation teacher, she’s taught hundreds of thousands of people how to create simple yet powerful meditation practices. 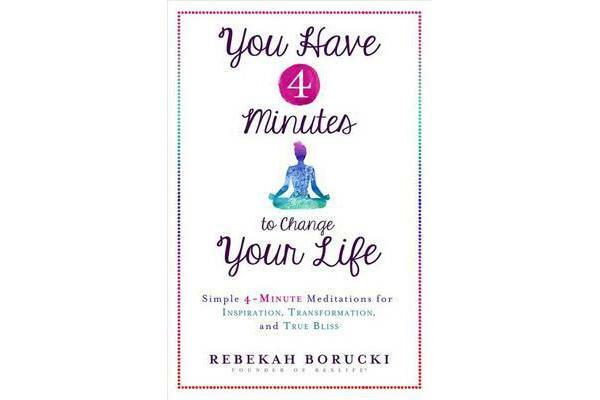 In fact, as she’ll show you in this book, in as little as 4 minutes, you can change your life. After years of suffering from anxiety and depression, both as a child and adult, Bex took control of her mental and physical health by establishing a fitness and yoga routine that quickly evolved into her own regular, homegrown 4-minute daily meditation practice. 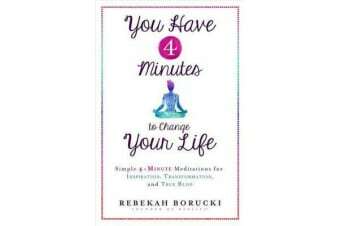 Bex’s 4-minute meditations combine mantras, affirmations, breathing and bodywork techniques, and they’re designed so that even the busiest people can fit them into their lives. Here, Bex guides you through 27 different meditation practices, and shares personal stories that demonstrate how meditation has helped her overcome various challenges. She also answers commonly asked questions like oDo my eyes have to stay closed?o and oWhat do I do if my body starts to hurt?o; provides technical information about props, postures, and mantras; and offers tools to cope with complex issues such as grief, body acceptance, and relationships. By spending just 4 minutes a day with this practice, you will find deep, meaningful, and lasting healing.